Stunning, very correct and super personable chestnut filly with chrome. Born May 02,2002. Will mature 16hh+. Has excellent temperament from both parental sides. Will excel in any discipline and along with personality she has wonderful, lofty movement. Price is $6500 American obo. Located in Salmon Arm, British Columbia Canada. Call 1-250-832-7008 or email: shattock@telus.net **Newsflash** Vanna Dee Fair and her dam have tied for "champion of the day" against a trakehner at the 2002 Canadian Warmblood Inspection in British Columbia. This stunning filly is now officially registered as a Canadian Warmblood. Price reduced to $5000 US! 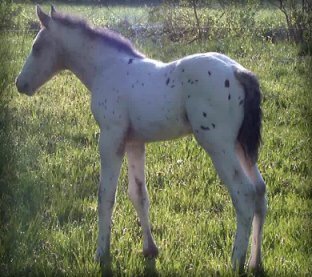 Black Arabian/SWB Sport Horse Filly. Born Feb 2003. Both parents approved by the ISR/Oldenburg Registry. This Filly has the best of both breeds. The Arabian influence is very evident in both Appearance and Temperament. The Warmblood influence will be her size and movement. She Leads, Loads, Clips, Bathes, and stands for the farrier. Both parents and additional photos may be viewed by clicking on photo above. Price is $6000 US. Located in Florida, USA.